I am very proud to announce that 'Our West End' has been approved for funding from the United Way to develop a parks committee in the Bridgeview neighbourhood, establish a west-end roundtable of community stakeholders to provide guidance and resources, tackle issues such as graffiti and general clean-up, and develop a strategy for the west-end focusing on neighbourhood engagement and empowerment. The funding is for two years. We have partnered with the Centres for Seniors Windsor right on McEwan and Wyandotte and they have been gracious enough to provide us with office space and resources. We couldn't have asked for a better community partner and wouldn't have been able to receive the funding we got without their help. The west-end crawlers raised over $300 from their first yard sale. They will be grocery shopping shortly for the local food banks. Job well done!! "Today I am writing to forward a comment from a west end resident, he said when he was walking down Russel street (near Brock school area) by the river, he could not find a public garbage bin, it would be great if city would consider to place some garbage bins in this area. 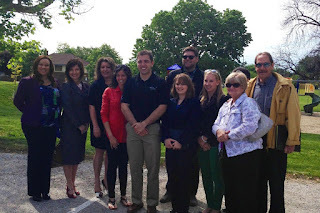 Let's work together to make our west end clean and beautiful! Thank you very much." "Hi Fabio! I wondered if you could post a casting call from Crosstown Players? They are looking for talent, and their show date for their 1812 Series play "Sarah Girty's War", is June 28th. Not far off, so people should contact James Mays, as soon as possible! http://www.crosstownplayers.ca/contact.htm Thanks!" A new restaurant recently opened up on College Ave., just east of Campbell, called Stathis Grill. I am looking forward to checking it out, and you should too! It has replaced the former "Dean's" that was located there. Whenever a business invests and locates in an area, it is a sign of confidence in the neighbourhood. We should all show our appreciation by supporting these investments and businesses in any way that we can. Could you please post this to the Our West End Blog in support of The Summit Centre for Preschool Children with Autism's bid for new playground Equipment? The winner is chosen by popular vote on Facebook, and we need more votes!!! They are located at Prince and College Ave, a great gem in the West end!! 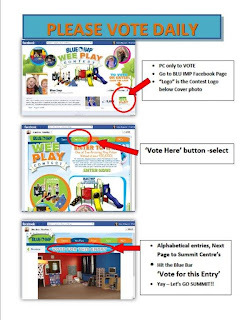 Voting by PC instructions below. Vote Daily and Thank you!!!" completely privately run, relying on donations only, not government funded. Pathway at the End of Mill St. I recently received an email from a west-end resident saying how wonderful it is to see so many people using the pathway and park space at the end of Mill St. Many folks are fishing there and enjoying themselves since the area has been cleaned up. If you are in the area, take a stroll and see for yourself! I recently purchased a bike at Courtesy Bicycles (www.courtesybicycles.ca) in Olde Sandwich Towne. It's a great place with great service. I am looking forward to riding on beautiful days like today. Hope you're all having a great long weekend and enjoying this beautiful weather. "Hi fabio we are having our first skateboard competition on June first at 12 noon at Atkinson and we sill have hot dogs chips etc. and some home made crafts and some cookies come out and attend hope to see you there. We are also doing swimming registratioon for the working poor kids. If you know of any tell them to bring there income tax receipt and talk to us the cost to the families is $10.00 per child the cost for the first session is about 86.00 dollars we pay the differrence any money extra we roll back into the swimming program. the senior pass for this year is $45. from June 23 - labour day 7 days a week and any nights and it covers all pools June 24 is firer works night there will be a night time swim and barbeque at atkinson. the parking lot will be blocked so people using the pool and park can park the barigades will be taking down at about 8 pm Your friend marilyn"
1) If you live around St. John's grade school, please keep your eye out for any activity at night time around the school. Windows have been found open and it has been alleged that some youth were found on the roof of the school. If you see anything, immediately call Windsor Police. 2) The Bridgeview neighbourhood watch group is looking for interested walkers. If you live in the neighbourhood and want to walk once a week or more with the group, please call Wilfred Birch at 519-977-5510. The group is thankful for all of the volunteers and block watchers who are helping make the neighbourhood a much safer place. 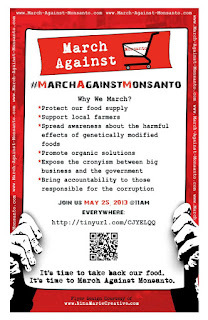 Friends, This was sent to me from a fellow west-ender: March Against Monsanto On May 25, 2013 @ 2 pm we will be holding a PEACEFUL march against Corporate giant Monsanto. Monsanto to those who do not know have a patent on GMO seeds. It's a company that chemically grows our food, they first started making chemical weapons and now they grow most of the food we eat. 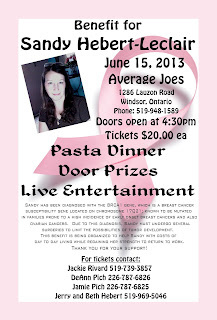 Please see the following fundraiser held for someone in need. This was sent to me from a local west-ender. Anything you can do to help would be greatly appreciated. Below is the West End Crawlers monthly update. They are doing great things for the west-end. We are lucky to have them.